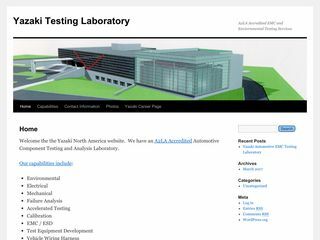 The Yazaki Testing Center is an A2LA Accredited Testing Laboratory. The laboratory was expanded to add EMC testing capabilities in the year 2000. We are conveniently located in Canton, Michigan at the corner of Haggerty and Warren Roads. We specialize in automotive EMC testing for General Motors GM 3097, GM 3172, Ford CS-2009, Chrysler, Toyota and Honda. We offer A2LA accredited Electrical and EMC testing services. Our experienced staff is iNARTE certified in EMC and ESD. We also offer RF shielding effectiveness, environmental and mechanical testing services. In addition we can design and fabricate test system monitoring and control systems. Please contact us if you would like an estimate.